DAVE PIETKA picked a good year to open a snowboard boutique. With La Niña predicted to drop an extra few hundred inches of powder on Mount Hood this winter, Pietka’s latest endeavor, Castle Boardshop, seems practically assured of a soft landing. The owner of the Mountain Shop—which, at 73, is one of the oldest outdoor stores in the country—launched Castle in October, wanting to create a specialty shop for Portland’s boarders. “When you have specific outerwear for specific types of shredding, a certain type of board or binding or boot for a certain type of customer, and a staff that has really technical knowledge of your product, then you have a complete shop,” explains Castle snowboard and surf tech Jordan Huotari. Castle’s personnel certainly fits the bill: collectively the staff of two have more than 30 years riding experience. 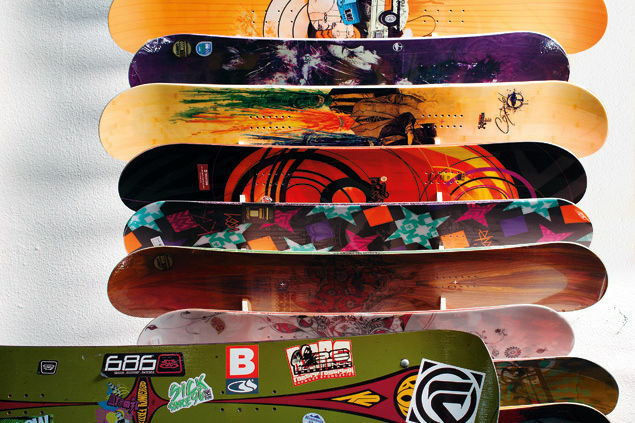 And they keep the store stocked with seven different board brands, including top sellers Capita and Arbor, although they also have a soft spot for Northwest brands, such as K2 and Bonfire. Not ready to commit your Benjamins to buying a board? Castle will let you demo rides on a weekend and apply the rental fee toward your final pick. And it’s the only place in town that rents “splitboards,” adaptable rides sliced down the middle so riders can shuffle, cross country-style, up a slope and then snap the halves together into a board at the top. Castle isn’t just counting on Hood’s year-round ski season to keep it afloat, though. When the white stuff melts, the shop will transition its merchandise to a different kind of ride: surfboards, paddleboards, wet suits, rash guards, and beachwear. Bye-bye, La Niña; hullo, la playa.